This month we talk to Prarthana Pednekar of Mumbai, an independent hospitality professional. She has a B.Sc. in Hospitality and Hotel Administration from IHM in GOA, and an M.Sc. in Hospitality and Tourism Management from the Welcomgroup Graduate School of Hotel Administration at Manipal University. In 2011, she completed her post graduate studies at Manipal with flying colours - winning the Best in Academics, and Best Graduating Student awards. Prarthana also has a post graduate diploma in human resource management and has worked with a leading placement company as a hospitality recruiter. Q: What do you think of timeshare as a platform for long-term vacations? A: Personally, I think it’s a brilliant platform giving you exotic holiday destinations in India and all over the world. I had even considered vacation ownership as one of my focus areas for my final dissertation, but I eventually picked another topic suggested by my guide. To give you a ring-side view, I think it will be useful to promote timeshare in a generic way in India. The larger organizations naturally have a larger share of voice and are visible – so the product gets tagged as an offering from the company. Timeshare in its generic sense does not get promoted. I know many young people representing your target group who don’t know anything about timeshare, but want to know more when you explain the concept to them. Q: Since you also have an F&B background, what do you think of food at timeshare resorts? 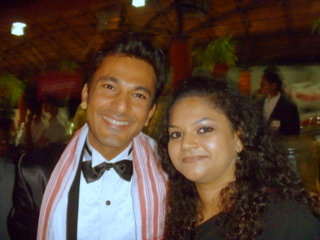 Prarthana Pednekar with her Indian Idol, Vikas Khanna, during one of his visits to Manipal University. Vikas Khanna is an alumnus of Welcomgroup Graduate School of Hotel Administration. A: I can understand that food is always a big draw in a holiday plan, because a holiday is like a treat and you want to eat nice food three or four times a day. And this can be a big challenge and responsibility for resort owners, and believe me it’s not easy doing that even if you have planned and streamlined systems in place. One of the things resorts can consider – if possible – is to include local delicacies and flavours in their menus. The better known resorts do that, but most others offer a pan-India menu to play safe and avoid wastage. It’s always a good idea to present something home-grown to add local flavor and excitement. Q: Since you’ve done placements for the hospitality industry, what do you think of timeshare as a career option? A: Broadly, a resort and a hotel have the same intensity of workplace challenges - especially in terms of meeting stringent standards and customer expectations. They’re part of the same hospitality pie, but job seekers and career aspirants will always weigh opportunities against pay packets. I guess that means we need to see what timeshare pays in comparison with salaries in the hotel industry. Some mid-level chefs have told me that there’s a bit of a drop if you switch to the timeshare industry, and if this is true we need to achieve some kind of parity. Q: As a logical next question, what’s your view of on-the-job training for this industry? A: I’m sure all leading players have well-managed training modules in place for orientation and on-the-job progression. From my point of view you need a finishing school of sorts, that gives young job seekers an insider’s perspective of the timeshare industry. One way to do this is to ensure a liberal offtake on internships at campus recruitments. I also think internships should enable a fair balance of industry exposure and learning opportunities – with a good sprinkling of career guidance, in what can be one of the most stressful work environments you can come across. Q: What do you think of AIRDA’s role in India’s timeshare industry? I am happy that lead players from the timeshare industry in India have set up a voluntary regulatory body called AIRDA. From my point of view, the best kind of regulation is regulation that happens from within and not enforced from the outside. I also spent time looking at the AIRDA website to discover the many roles that your organization plays to support and promote timeshare in India. Maybe you can also keep my suggestion in mind on the generic promotion of timeshare to a wide range of prospects. The good thing about timeshare is its longevity – 25 years is a really wide window. I’m not married as yet, but I’d love to imagine my husband as someone with a healthy work-life balance. And if he’s got timeshare on his priority list, he’ll earn additional brownie points from me.